Molly was nine years old when TJ arrived into Marie’s household: he was just a baby rabbit, and Molly took to him at once. At first Marie was cautious about allowing her dog get too close to a young creature which might be viewed as prey, but Molly made it clear that she wanted to be friendly with the new arrival. It was as if she wanted to mother him: she tucked him into the curve of her body when she curled up to sleep, and he enjoyed the attention, snuggling into her as if she was a replacement for his own mother. Marie’s two cats also accepted the young rabbit as a friend rather than an enemy. TJ is kept as a “house bunny”, living free-range in Marie’s house, using a litter tray like a cat, and doing exactly as he pleases. He was neutered when he was one year old, because he was starting to be a bit too adventurous, trying to follow the cats out through the cat flap and even attempting to hop over the garden wall outside. Since the operation, TJ has settled down, and he now lives happily indoors, spending most of his daytime hours in Molly’s company. He hops around after her, and if she settles down for a snooze on the sofa, he’ll jump up beside her and tuck himself in at her side. Molly and TJ are even fed together, with their food bowls side by side: there’s no competition for food, because Molly’s a carnivore, and TJ is a herbivore. In the evenings, both Molly and TJ sit with Marie, with the three of them watching television together. A month ago, Marie noticed that TJ had started to sneeze more often than before, and he had developed a discharge from his right eye. At first she thought he might just have a cold, but when a swelling came up on his right cheek, she realised that something more serious was going on, and she brought him to our clinic. It turned out that TJ had an abscess, most likely associated with one of his tear ducts. 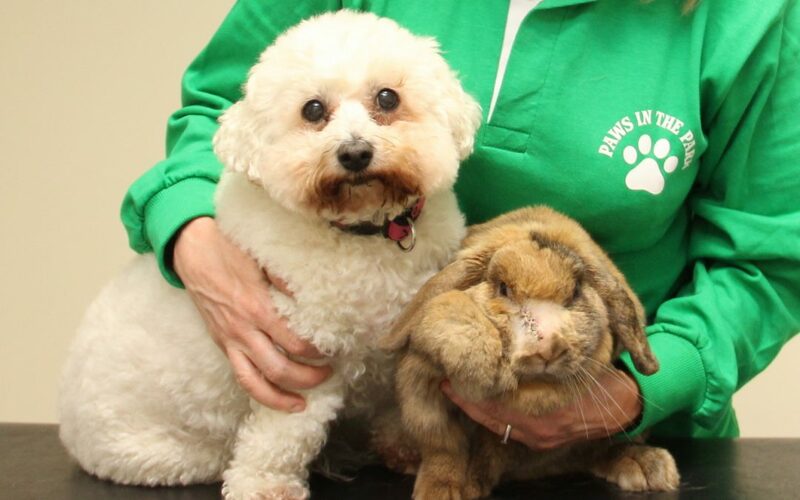 Abscesses in rabbits can be very serious: the infection can be difficult to eradicate. They often need to be treated like a form of malignant cancer, cutting them out completely, as well as treating them with long courses of high levels of potent antibiotics. TJ was admitted for an operation to remove the abscess surgically, ending up with a two-inch incision and a row of stitches in his face. Marie was given detailed instructions on post-operative care: he was to be given his antibiotic ground up into some tasty food, and he was to have the wound gently bathed twice daily. Marie found it difficult to give him the antibiotic – he’s a fussy eater – but the wound bathing was far easier than she had expected: Molly decided to do it for her. As soon as TJ came home, Molly went up to him. They sniffed nose-to-nose, then Molly gently started to lick TJ’s wound. Marie was about to stop her from doing this, but she didn’t need to: after a few licks, Molly stopped herself. A simple but effective routine soon developed – two or three times a day, Molly licked TJ’s face. It was far more effective and stress-free than if Marie had tried to pin TJ down to do it herself. Two weeks later, I removed the sutures from the abscess wound, and it’s healed perfectly. Thanks to Molly’s natural nursing skills, TJ is back to normal.